You never know what will set off a public reaction. 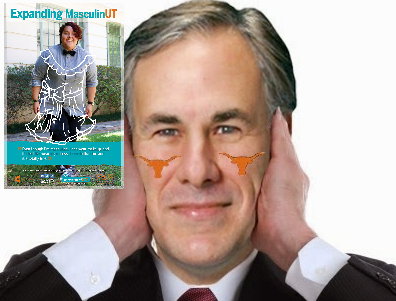 In the past year, the University of Texas has: Been sued multiple times over politicized Title IX processes (while allegedly attempting to protect a football coach), had violent communists revolutionaries running rampant on campus, and attempted to accept money from the Chinese government at the same time they want to manage the U.S. nuclear weapons stockpile. But it looks like this MasculinUT nonsense was the final straw. There's a lot we could say. Obviously, its dumb. Obviously, the "diversity" industrial complex is out of control. A lot of obvious things are true. But it comes down to this: Greg Abbott has jurisdiction; he's not using it. Texas is an allegedly conservative state. And it has an allegedly conservative Governor. And, according to the Texas Constitution, the Governor appoints the Boards of Regents at the various public universities. Obviously, there's a lot of history here that isn't worth re-litigating. But the fact remains that, when Rick Perry was Governor, university regents fought the bureaucracy. And that's no longer the case. In that testimony, we told the Texas Senate that if they confirmed those regents, the University would a) raise tuition again and b) political correctness would get worse. The tuition hike happened six weeks ago. "MasculinUT" qualifies as political correctness getting worse. Bottom Line: The Governor's office has jurisdiction.